This is a detail of a marvelous 13th century icon of the Holy Prophet Elias (Elijah) from St. Catherine’s Monastery at the base of Mount Sinai. 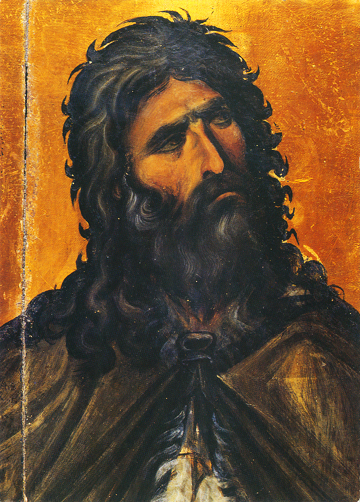 In this detail of the icon, the Holy Prophet Elias is looking intently upward toward God and is in a state of Divine vision and understanding, which transfigures his heart and mind. This is quite an unusual depiction, hard to show in visible form. God has sent a raven to feed him in the wilderness, but the Prophet sees God’s Love and Providence even more than the raven. The Holy Prophet Elias lived in the ninth century before Christ and had a fiery ministry before the Lord. He was called to correct King Ahab and his pagan wife Jezebel, who had defiled the Kingdom of Israel by the pollution of the worship of the idol Ba’al, and by listening to the false prophets of this false god. The more complete story of the Prophet Elias is found in I Kings, chapters 18 through 22. This icon shows a remarkable dynamic livelihood in the asymmetrical form which is still balanced in the position of the shoulders, face, and head. This is truly great Byzantine iconography. Rarely has spiritual grace been depicted more clearly.